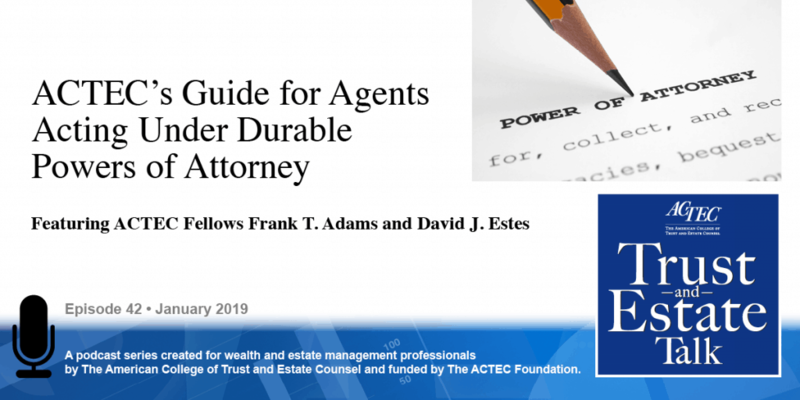 “ACTEC’s Guide for Agents Acting Under a Durable Power of Attorney.” That’s the subject of today’s ACTEC Trust and Estate Talk. This is Susan Snyder, ACTEC Fellow from Chicago. In the next few months, ACTEC will be finalizing a guide for agents acting under a durable power of attorney. 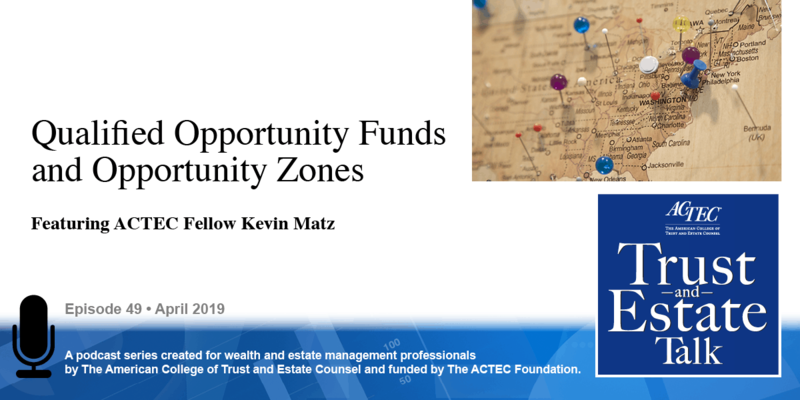 To discuss this topic you will be hearing today from ACTEC Fellows Frank Adams of Coral Gables, Florida and David Estes of Scottsdale, Arizona. Thank you, Frank and David. Thank you, Susan. 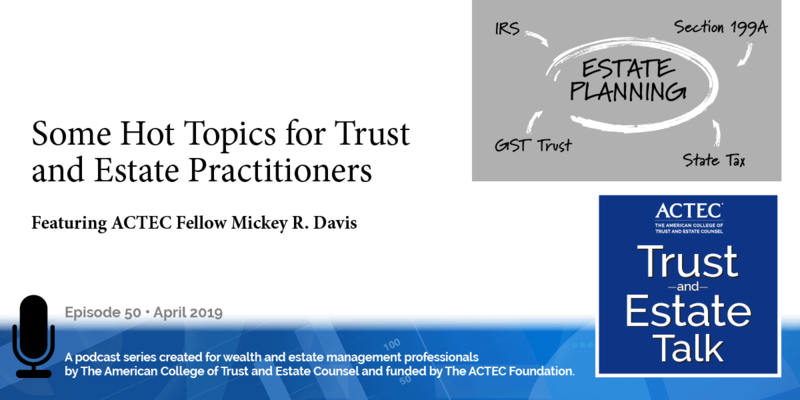 This is David Estes, we’re going to be talking today about a guide that the ACTEC Practice Committee has prepared to assist people who might be acting as agents under a durable power of attorney. A power of attorney is just a document by which one individual, called a principal, identifies another individual, called an agent, to act on behalf of the principal. A principal can be designating someone to act purely in a revocable or amendable capacity, but what we really care about is powers of attorney that can be used by an agent when a principal becomes incapacitated. And that’s what we refer to as durable powers of attorney. So, durable powers of attorney can be an important piece of somebody’s estate planning program. 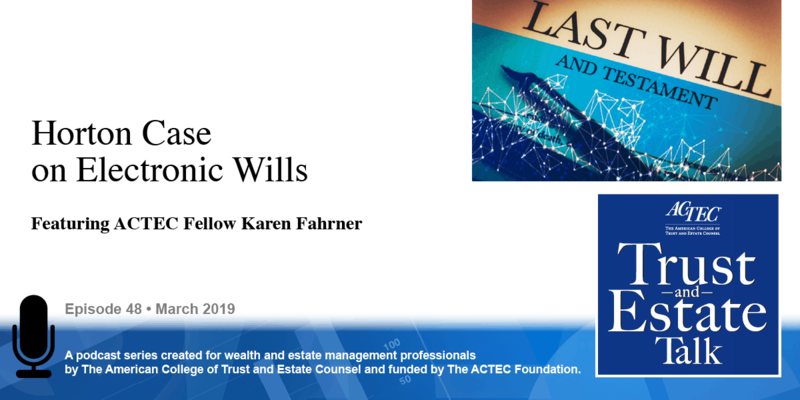 If we think of estate planning wills and trusts are primarily what happens to assets when an individual dies, powers of attorney are documents that can be used to address what can be done for the principal if the principal becomes incapacitated. And with that, we’re going to just go through the guide and the various things to consider when drafting or using a durable power of attorney. Hi, this is Frank Adams. The agent, as David said, is the person designated to act on behalf of another. When you undertake the role as an agent you have certain duties and responsibilities, the primary one- responsibility- is you must act in the best interest of the principal, you’re not acting for the benefit of yourself or for any other individuals. The primary goal is the principal’s well-being. So, that’s your general duty as the agent. 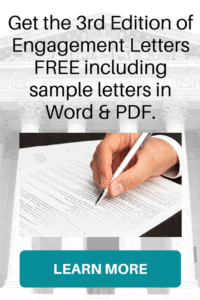 Your powers as to what steps you can take with respect to the principal’s agents will be defined by the document that creates the durable power of attorney and it may also be defined under state law. Every state has a set of statutes that govern durable powers of attorneys. When you act on behalf of the principal the first responsibility you might have is to gather and gain control of the principal’s assets, making sure that you’ve secured them. And you need to secure them not only from third parties but if the principal is incapacitated or incompetent you must secure them and make sure that the principal, he or she, does not frivolously give her assets away or get taken by a con artist and you’re trying to protect the principal from himself or from herself. And the primary purpose of these powers of attorney as estate planning devices is to- in some ways they’re insurance policies for a client just in case the client becomes incapacitated we’d like to know that the client has chosen who ought to act in his or her capacity without- we hope- the need for any kind of court proceeding for guardianship or conservatorship. So that’s the focus when we draft these powers of attorney. When we have a document like this and an agent needs to act it’s important the agent understands what his or her responsibilities are. That typically means reading the power of attorney, how broadly are the powers defined, what else does state law permit or require for an agent acting under a power of attorney. Once acting the agent is supposed to be acting exclusively for the best interests of the principal, keeping assets secure, making bills get paid, perhaps making healthcare decisions on behalf of the principal, all of which can be done without court proceedings and therefore can be an efficient way to care for the principal but under appropriate guidelines and limitations as imposed by the power of attorney itself or estate law. One of the first things you’re going to want to do as the agent is to communicate. And that communicates with banks or financial institutions or any other person who might have control or investment responsibility for the assets belonging to the principal. So you’ll want to go to the bank and show them the power of attorney and say, “I’m now acting on behalf…” so that when you write a check or you want to make a deposit in the principal’s account, or you want to pay bills on behalf of the principal your check or your authorization will be accepted. Other people you might want to communicate with are the principal’s attorney because that attorney will have a lot of information about the principal’s planning. Or the accountant for the principal. These advisors, the financial advisors- the attorney, the accountant- will help you a great deal in deciding or determining how you should act on behalf of the principal. So when we say an agent’s going to act on behalf of a principal often in the financial setting we’re concerned about the agent identifying the principal’s assets, making sure that they are kept safe and secure, make sure the bills are getting paid, make sure that assets are being invested appropriately. Which sometimes is simple, sometimes is very complicated because it may be that the principal may not be doing a very good job of keeping assets secure or investing appropriately, in which case the agent’s job can become more complicated. But the agent’s job is to identify the assets, find out what needs to be done, then consult with appropriate advisors, whether it’s a lawyer, accountant, investment advisor, to make sure that the principal’s interests are considered first and foremost and that all responsibilities of the principal are now being taken care of by the agent. So, while the undertaking of agent should be a thoughtful decision, again we’re trying to avoid being involved in the courts, we’re trying to make sure that the principal’s financial affairs continue to be well taken care of and to make sure that the principal is protected from himself or herself and people who might want to take advantage of the principal. And what that might entail, as Frank had suggested before, communication is very important, it’s communicating with the principal to the extent that the agent is able to do so. It may also under certain circumstances require communicating with other people in the principal’s family, it could be a spouse, it could be adult children, it could be tax authorities, it could be the court. The important thing that the agent understand, I’m acting on behalf of the principal, what are the steps I need to take to make sure that the principal is kept safe and protected as being financially responsible, etc. Once the agent has done that the agent then also needs to understand at what point might my authority terminate? Is it when the principal dies? Is it when the principal recovers from the disability? Is it when there’s a court proceeding where someone is appointed to replace the agent or as a guardian or conservator and, if so, at that point the agent may have some responsibilities for accounting for his or her actions while acting as agent. So those are things that are addressed, all these various topics are addressed in the guide which is intended not to be a comprehensive guide but a primer to identify issues and concerns that an agent needs to consider when undertaking his or her responsibility as agent. So thank you David, thanks Frank, on educating us on durable powers of attorney and previewing the ACTEC Guide.